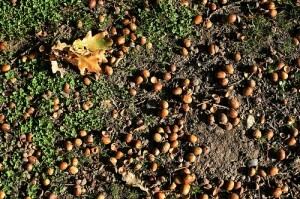 Once upon a time, in a not-so-faraway land, there was a kingdom of acorns, nestled at the foot of a grand old oak tree. Since the citizens of this kingdom were modern, fully Westernized acorns, they went about their business with purposeful energy; and since they were midlife, babyboomer acorns, they engaged in a lot of self-help courses. There were seminars called “Getting All You Can out of Your Shell.” There were woundedness and recovery groups for acorns who had been bruised in their original fall from the tree. There were spas for oiling and polishing those shells and various acornopathic therapies to enhance longevity and well-being. I heard the “Acornology” story on Sunday and haven’t been able to get it out of my head. “we… are… that!” said the interloping acorn, pointing up to the mighty oak tree above it. Isn’t that what every prophet has said? That we are that; that oak tree? 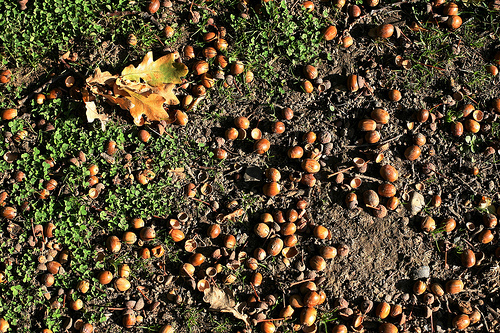 Acorns are to oak trees as we are to THAT. And don’t we respond with “but we’d stop being acorns!” in fear and loads of discomfort turning back to our self-help seminars, burnishing our acorn shells, caring so much for the shell that we forget that it’s meant to break open, that we are made for transformation. Like the acorn, we each contain the seeds of transformation, though not all of us realize our full potential. And I can’t help but wonder, what was going on with the acorn who indulged the crazy interloper? The one who kept asking, kept drawing out the rough and tumble visitor with the wild, crazy story? I like to think that curious one was a seeker like many of us. Doing what some of us do in church or other spiritual communities, gathering in community to hear someone do their best to shake us up, to crack us up and open, all the while pointing up, saying some version of “we… are… that!” and inviting each of us to break our shells open, to dig down, dig deep, to stop being acorns and perhaps to become oak trees?